Hargreaves was formed in 2006 by Chris Webb and James Healey. Claire was soon recruited, and Dave Turner completed the line-up. This page carries information on all former members and contributors. The band started off playing in Open Mics around Harrogate. This soon became support gigs, followed by headliners all over Yorkshire and the North East, and then by recording. After several changes of line-up, illnesses and a divorce, Hargreaves was reformed with a new line-up in 2015. This page records the musicians who helped get us to today. Claire was the original vocalist and principle songwriter. She also played guitar and keyboard, worked on production, photography and promotion. Claire trained as a jazz musician and teaches music at secondary school level, as well as singing with and leading several choirs, playing in and conducting school orchestras and bands. Claire was also a member of ‘Spot On’, a close-harmony vocal group that included her sister Laura who also occasionally sang backing vocals with Hargreaves. Before Hargreaves, Claire sang with ‘Soul Gathering’ and as a solo artist. James founded Hargreaves with Chris Webb in 2007. 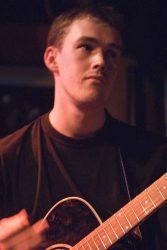 Having played in heavy metal bands at school and at university, James found new inspiration with Hargreaves’ mix of blues, country and soul influences. Sharing guitar duties with Chris, their contrasting techniques and styles created the core of Hargreaves’ sound. James was also responsible for ‘Lonely’ one of Hargreaves’ more challenging and emotional songs. His deceptively simple riff combines with Claire’s highly charged vocal for a real highlight of the ‘Sooner But Not Later’ album. Paul Howlings – played drums on our six most recent recordings. Stevie D – a fantastically creative drummer with influences ranging through jazz to punk and heavy rock, and to psychedelia and trance music. Stevie played on ‘Sooner But Not Later’. 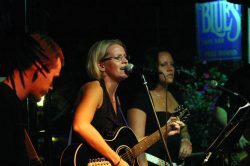 Laura ‘Ali’ Ashton – backing singer at several of Hargreaves’ key gigs. Dave Speake – drummer in the ‘Leeds Blues Festival’ line-up. Ian Hardcastle – produced ‘Sooner But Not Later’ and a number of other tracks and demos. Ian also provided backing vocals and keyboards to a number of tacks. Dan Mizen – produced the ‘Eight Days / Long Hard Road’ EP, and contributed drums, percussion, keyboards and backing vocals. Dan runs Warehouse Recording in Harrogate. Frank Mizen – legendary Harrogate musician, Frank played peddle steel guitar on ‘Long, Hard Road’. Jo Newton – took over from Claire as singer at a number of acoustic gigs and the ‘Leeds Blues Festival’ to give the band a more rock oriented edge. Mike Simpson – guitarist who stood in for James at a number of key gigs and played as part of the ‘Leeds Blues Festival’ line-up. Vincent Smith – drummer at a number of key gigs, including the Knaresborough FEVA Arts Festival. Dave Turner – Hargreaves’ original drummer. Dave played with Hargreaves up to 2008. Aneka Yeadon – backing singer on ‘Sooner But Not Later’ and at a couple of gigs. Jo Heather – sang from 2015-17. Mark ‘The Rev’ Kennedy – guitar during 2015 and sadly missed (RIP Mark). Paul Fedorenko – joined us on guitar on several occasions at The Blues Bar in Harrogate. Martin Rose – stood in for James at The Black Bull in Rippon.